With a growing need to innovate and compete to keep our customers' attention, rebranding can seem like a safe and smart option. While it can be in many cases, it is never a decision you should make lightly. We live in a world that is becoming increasingly connected; yet disconnected at the same time. While it has never been easier to communicate with anyone, anywhere in the world, we lose something when we stay behind the veil of technology – deeper relationships. We forget that relationships underpin every business transaction. The deeper the relationship, the more profound and profitable it becomes. Your customers crave connection – real connection – from the businesses they buy from. They don’t want to interact with a faceless business, hear from general autoresponders or enquire only through a web form. They want a real relationship, a real person – they want you. In the age of innovation, creativity is essential for your business growth and survival. With creativity ideas are born, problems are solved, industries are disrupted, competitors are overturned and customers are engaged. Without it, you become stuck, stale and predictable. Your ability to think creatively and act fast is often the difference between being the disruptor or being the disrupted. To ensure you stay ahead of your industry and keep your creative juices flowing here are six ways to overcome creative blocks. As research and experience are showing us, customers want more than products and services from brands they buy from; they want a story to tell and be part of. While we can often fall into the trap of trying to be the loudest in the marketplace to get attention and stand out from our competitors, the truth is you don't win the heart of your customer by them following your voice; you win it by finding theirs. To help you break through the noise of a competitive marketplace and win the heart of your customers, here are three ways to build a customer-centric business. When it comes to building momentum for your startup, a great idea and team will only get you so far. Sooner or later you'll need to find those first few brave souls who are willing to give you a chance - your innovators and early adopters. But how do you find them and how do they find you? Here are four tips to help you find your innovators and early adopters and get their attention. We all know that marketing and promotion is an essential part of business – but what if it takes you well beyond your comfort zone and seems to conflict with the essence of who you are? This is for the shy, humble and introverted entrepreneurs among us, the ones who would rather stay in their office than get out and network, and the ones who feel inauthentic and at times even arrogant when singing their praises. Here are four ways you can help build credibility and customer base without feeling like you are bashing, bragging or boring people with your sales message. Every day we are exposed to thousands of brands and marketing messages. Texts, emails, social media, television, radio, billboards, cars and buses all tell us what we need to be, do, have and buy. As a result, our customers have never been more savvy, or more immune to marketing messages as they are today. For those of us who play in overcrowded market places or are busy creating new ones, the need to be different and memorable in our marketing has never been more important. Here are three copywriting tricks to help. When it comes to putting together a successful marketing campaign you need to know your market, but a general overview will only get you so far. To get that intimate voice in your copy where a potential customer wonders “are they reading my mind?” you need to get to know your buyer. One of the best ways of doing this is to establish buyer personas, avatars that describe the people you want most as your customers. These avatars embody the demographics, characteristics and behaviours of your ideal customers, and give you a single person to direct your blog posts, social media updates, videos and sales copy to. But where do you start? While ideally you want to interview your ideal customers to get it straight from their mouth, you can also start to establish personas by looking at past customers and who you want to work with. Here are some questions to ask to get you started. There is nothing more thrilling than having an idea, bringing it to life and watching customers buy and spread the word. But marketing your startup isn’t always smooth sailing, there are ghastly winds that can blow you right off course. To help here are three startup marketing traps to avoid. With customers bombarded with so many brands and advertisements each day, it is your job to make your marketing messages more persuasive and relevant to break through the noise. But where do you start? Here are six tips to help you make your marketing messages more persuasive. Whether you are designing a product, developing a marketing strategy or writing a blog post having a thorough understanding of your target marketing is vital. But how do you get clear on who it is you are talking to and targeting? Here are four questions you MUST ask to get to know your customers - and why you need to ask them. Are your motives costing you business? Networking can be an interesting experience. While you meet a lot of different personalities and businesses, two types of people tend to stand out in the crowd, those who are interested in building relationships and those focused on the sale. While we need sales to survive in business, there is a real danger in making sales your only focus. Could your motives be costing you customers? To niche or not to niche? It's an age-old question that many business owners struggle to answer. But the truth is if you want your marketing to be as effective as possible you need your target market to be an inch wide and a mile deep. When you try to be everything to everyone you risk appearing irrelevant to those customers who you want and need the most. Still not sure? Here are four opportunities you open up when you pick a niche. Few things can kill your business faster than becoming irrelevant to your customers. The hard fact of business is that change is inevitable, while you can be on trend and meeting needs and wants one day, there is no guarantee that it will be the same the next. With greater competition, new technology and changing customer demands how do you ensure you stay relevant in the mind of your customers? It doesn't matter if you are pitching an idea, promoting a product or delivering a service, to make a sale your customer needs to believe in you. But with only minutes to win them over, where do you start? Your customers are one of your most valuable assets in business. They not only provide the necessary income through sales to help your business survive, but they also provide valuable insight into your products and services, and the best way to market them. If you want to find out how to be more strategic in your marketing, spend your budget more wisely and attract more of the customers you want to work with, the answer lies in your existing customers. Here are four marketing lessons your customers can teach you. 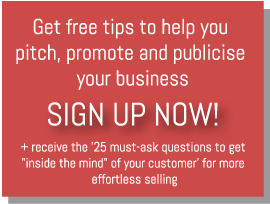 Questions are powerful in sales and marketing. When you use them right they uncover needs, challenge thought processes, demonstrate your uniqueness and increase conversions. If you aren't convinced already, here are four reasons why you need to ask your potential customers more questions in your sales and marketing. One of our greatest strengths as entrepreneurs can also be one of our greatest marketing stumbling blocks - our vision. Our ability to disrupt industries and think up products and services that fill needs our target market doesn’t even know they have yet can make for some incredible businesses and profits. But for the very big picture disrupters and entrepreneurs with new and unique ideas, it can also lead to a lot of education to convince customers to buy from you. While you may have the next brilliant idea that people need, if your customer doesn’t want your product it won’t matter how good it is. Still not convinced? Here are three reasons why you need your customer to want you. Having the confidence to establish yourself as an expert doesn’t always come easy, particularly for the more humble among us. But to build your profile, and make the difference that most entrepreneurs want to in business, you need to. To give you a little more confidence that what you have to say is of value, here are four truths to accept when positioning yourself as an expert. While marketing is an essential part of business, it can also be one of the first areas we put on hold when we get busy. Sure it saves us time in the short term, but with consistent marketing being the key to consistent business, it can cost our cash flow in the long term. To help you streamline your marketing efforts and stay consistent even when you are short on time, here are three marketing time savers you can implement without impacting your results.